I bought a few things these past three weeks, some of them online and some from the department store, but I didn't get a lot so this will be a small haul post. I start with the two products I got from Feelunique a few weeks ago. 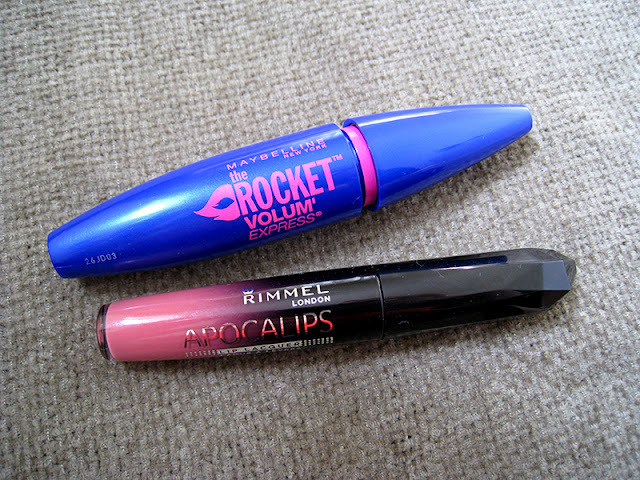 The first one is the new mascara from Maybelline, The Rocket. I read so many good reviews about this mascara that I had to try it! So far I've only tried it twice, and my first impression is that this is a super black volumizing mascara. It doesn't make my lashes longer and it doesn't do a good job at seperating them, but maybe that's because the formula it's still very wet. Overall I really like it! 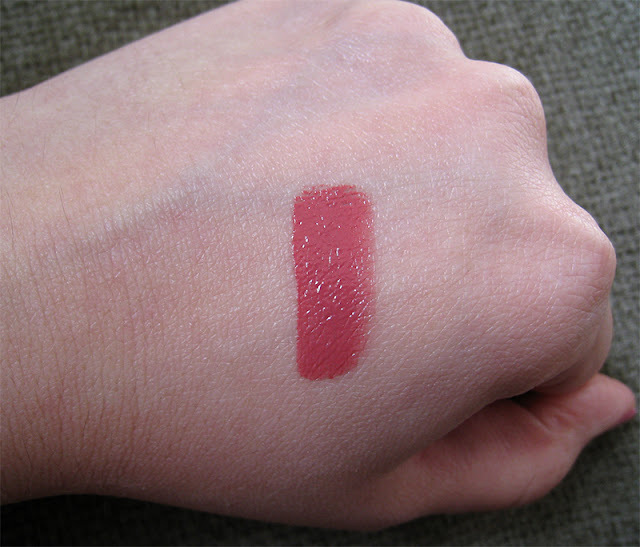 I thought it would be more of a medium pink beige shade, but no it's dark and rose. Maybe I'll wear it in the fall or winter time but not for spring and summer. A new eye cream was in my must haves for this month because my Kiehls Avocado one finished, and I wanted to try a new lighter one. Since I have a few fine lines around my eyes I decided this time to go for an eye cream that has anti wrinkle properties and not just a moisturizing one. 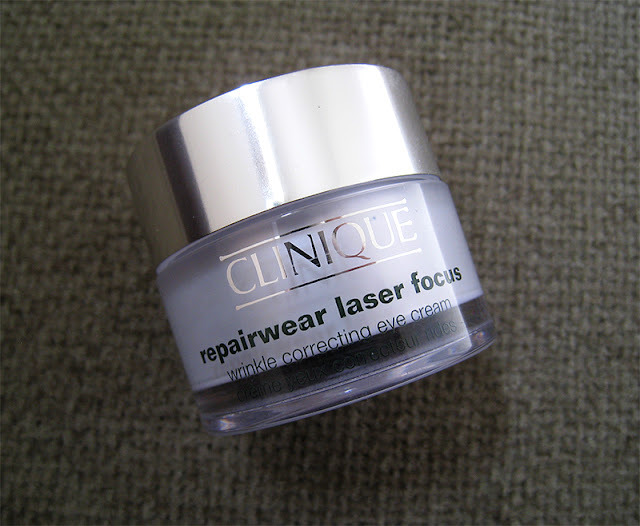 The Repairwear Laser Focus eye cream is a new release from Clinique, I'm using it for two weeks now and I can't tell if it does anything for the fine lines yet but I'm absolutely in love with the lightweight texture! It wears really good under concealer, and it doesn't feel thick or sticky like the Kiehls Avocado does. Essie Under Wear and Come Here! 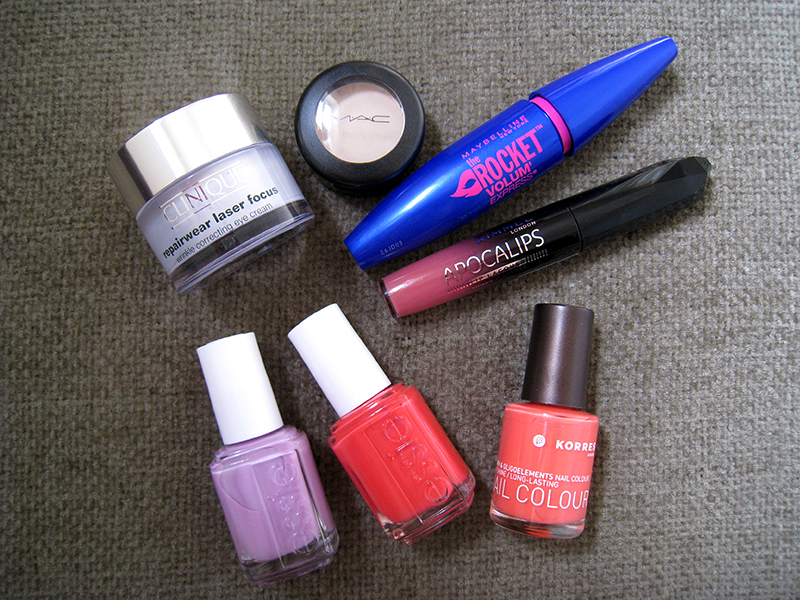 nail polishes. 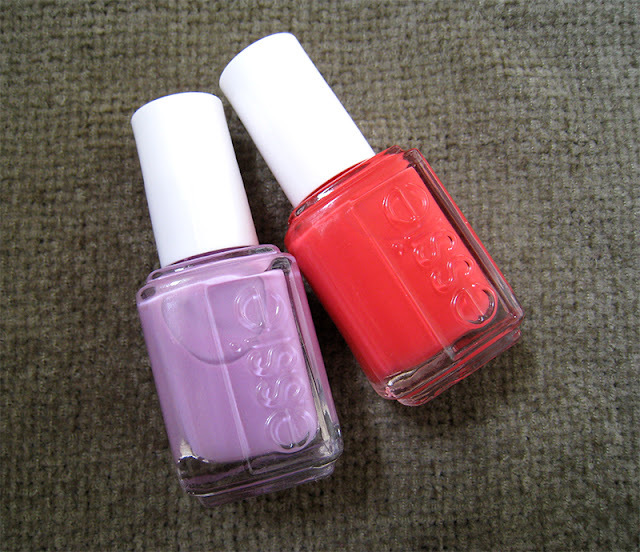 As I told you in my Spring Beauty Wishlist post, these two shades from the new Essie Resort 2013 collection are the ones that I wanted the most, so I ordered them from Ebay. 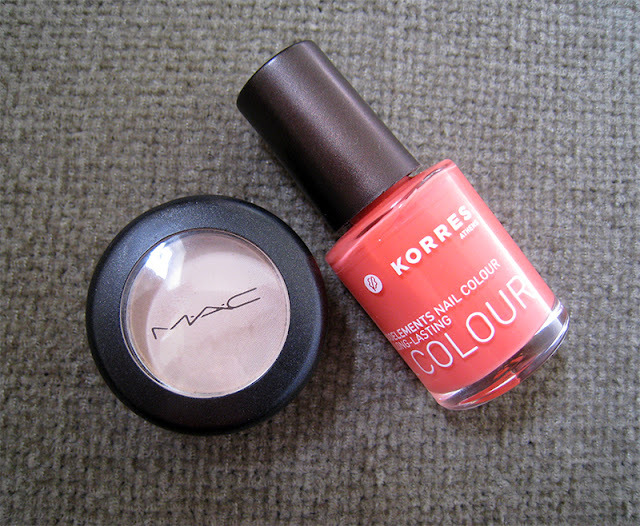 Both are incredible beautiful shades, Under Wear is a soft lillac shade and Come Here!, which is my favorite, is an almost neon coral red. If you love these kind of shades go and get them, you won't regret it! I was propably the only person who didn't own this eyeshadow, and I only got it because it's portable and I can take it with me when I'm travelling. I love my Too Faced Heaven eyeshadow as a browbone shade but I can't take it with me without taking the whole Natural palette too, so Brule was the closest one I could get. It's not as bright as Heaven but it does the same job. Pink Flamingo is one of the Korres new shades for the spring/summer 2013, and it's a coral pink shade. I just couldn't resist to that shade, it's so fun and summerish. Too bad for now they're only available in Greece, but if you can find it, please get it, it's so perfect! I hope that you liked my small haul. Let me know if you are lemming or already own any of these. Love the nail polish picks! I don't own Brule either :) I always hear about it though! I just ordered come here and first timer from ebay!and hey I don't have brule either :) i also got the rocket and I'd like to see your opinion for the clinique creme! Love, What camera do you use? I'll do a review for the mascara really soon! Agree with the apocolips review! They are awful and o drying on the lips!! It's good to see that I'm not the only one who didn't like them! Yes, I didn't like the color at all. Lovely Essie shades. I'm with you, not really a fan of the Apocalips - find them too sticky and quite drying, and they don't last two seconds. I thought they were going to be like the Maybelline 24hr Superstay ones, which are basically liquid lipsticks which dry and stay put for the whole day, but Apocalips just transfer onto everything! Ohh I see lots of ppl do not like them. Indeed I find it very drying! 1st Blog Anniversary Giveaway Winner.